Water pumps provide a requirements-oriented coolant circulation in the cooling circuit and thereby prevent overheating of the engine. They are driven by the camshaft via a V-belt, which runs on a pulley or vibration damper. The service life of water pumps is highly dependent on the coolant quality, the condition and reliability of adjoining aggregates, as well as professional installation. The water pump shaft is driven by the pulley. This is made from highquality roller bearing steel and also serves in many pumps as an inner ring for the roller bearing. The water pump bearings are perfectly adapted to the forces, acceleration and rotation speeds of the belt drive. Mechanical seals constitute the core of every water pump and must be of the highest quality in order to prevent leakage. The DT mechanical seal is pressed snugly into the water pump housing and, with the help of a coating of special sealant, hinders twisting and loosening. Springs adapted to the seal ensure correct contact pressure of the silicon carbide sealing washers. 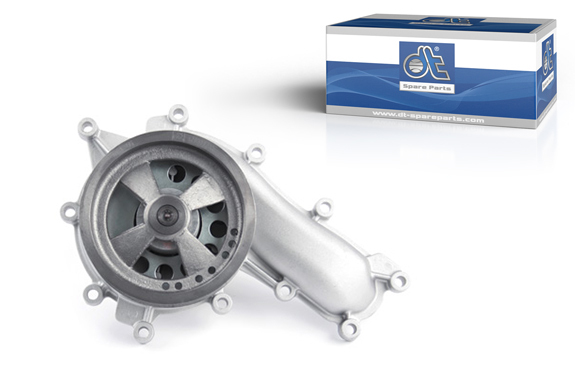 The impellers of DT® Spare Parts water pumps are optimally constructed to allow a high flow rate of the coolant and thus to achieve a high level of efficiency. The earlier metal impellers have been replaced by plastic (PPS, X-TEL) impellers in modern applications. The reduced weight of these impellers prevents the formation of air pockets in liquids (the so-called cavitation) and minimises bearing load.